Fleece hammocks are very popular with chins. They are adorable when they are lounging around in one. I make and sell them or you can make your own. Just make sure you always use fleece fabric only. Other fabrics such as cotton or flannel will break down into string fibers and if a chin should chew it he could choke on them or get a limb tangled. I make all the hammocks for our chins and I like to use Blizzard Fleece or Anti-pill Fleece. It holds up very well and washes and dries beautifully. I keep it simple and make my hammocks square and the chins love them. For a single or two small chins I cut the fleece 17" x 17" and sew it with the good sides together with a 1/4" seam. I leave about 3" open on the last side to reverse the fabric. I then fold in the rest of the 1/4" seam and close it up using extremely small tight stitches making sure to cut any thread right to the fleece. For two or three chins I cut the fleece 19" x 19". Always hang the hammock near a shelf or ledge, preferably on both sides of it, so he can easily climb in and out of it. Having two hammocks available is nice so when you are washing one, your chin will still have one in his cage. You should use nickel plated grommets and hooks to hang the hammock. 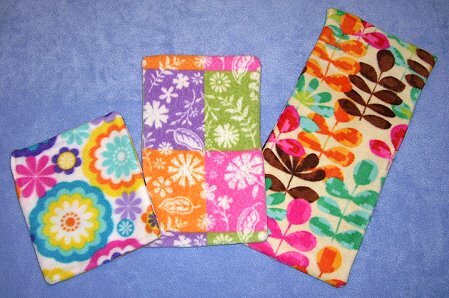 I like to make fleece shelf pads also. 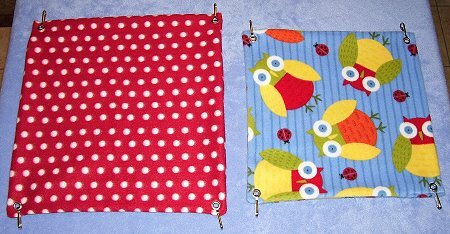 I make them in various sizes and they are great to give your chin something soft to lie on in their house or to cover a wire shelf if you want.